Prominent Christian activist and bestselling author Shane Claiborne will offer two public talks at Emory University's Candler School of Theology Oct. 23 and 24. A sought-after speaker on Jesus, peacemaking and social justice, Claiborne will present "Jesus for President" Oct. 23 and "Resurrecting Church" Oct. 24. Timed just two weeks before the presidential election, "Jesus for President" is a talk designed to spark the Christian political imagination, says Claiborne. Rather than endorsing one political party or candidate, he plans to discuss the question of how Christians should function in the political system. The Oct. 23 event is at 7 p.m. in Glenn Memorial Auditorium on the Emory campus. Admission is free, but registration is required. Register for "Jesus for President" on Candler's website. In "Resurrecting Church," Claiborne will share how his experience as an advocate for homeless families living in an abandoned cathedral reshaped his understanding of what it means to be the Church in the world. The Oct. 24 event is at 11 a.m. at Candler School of Theology on Emory's campus. Admission is free, but registration is required and seating is limited. Register for "Resurrecting Church." 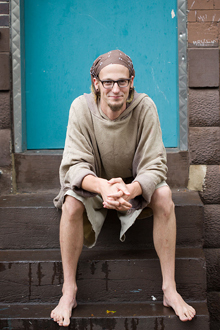 Claiborne is a pioneer in the New Monasticism movement and a founding member of The Simple Way, a faith community in inner-city Philadelphia that has helped to birth and connect "ordinary radical" faith communities around the world. His ministry experience varies from a 10-week stint working alongside Mother Teresa in Calcutta to a year spent serving a wealthy mega-congregation at Willow Creek Community Church outside Chicago. The bestselling author of several books, including "The Irresistible Revolution" and "Jesus for President," Claiborne is featured in the DVD series "Another World is Possible." His work has appeared in the Wall Street Journal, CNN and National Public Radio, among others. Shane Claiborne's appearance at Candler is made possible with funding support from the Blackard Fund. For details, visit Candler's website, www.candler.emory.edu.